Sometimes, less exposition is better. 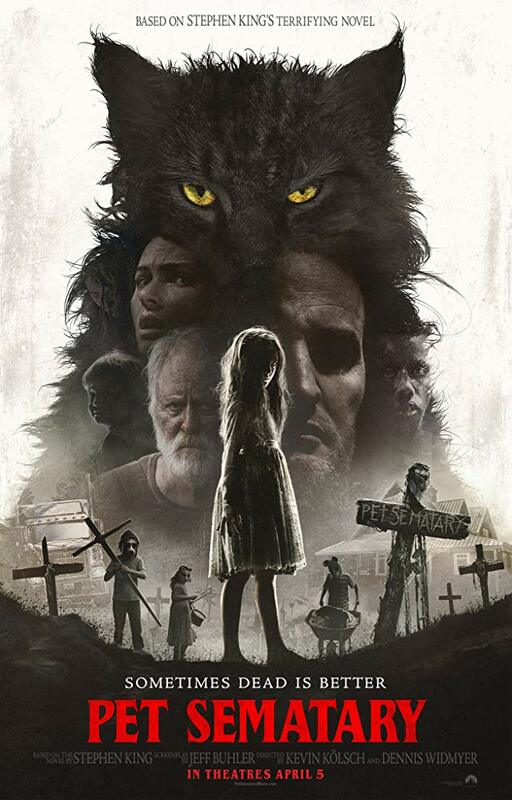 Starring Jason Clarke, Amy Seimetz, Jeté Laurence, and John Lithgow, Pet Sematary is the remake of the 1989 original of the same name based on the Stephen King horror classic. It follows Dr Louis Creed (Jason Clarke) and his wife Rachel (Amy Seimetz), who relocate from Boston to rural Maine with their two young children. But when their neighbour (John Lithgow) tells them of a mysterious burial ground deep within their property, they find out that sometimes, dead is better. I can remember watching the 1989 version of Pet Sematary as a kid, and it terrified me! The Zelda scene in particular haunted me for years, so I have fond memories of the original, even if it is cheesy and dated by today’s standards. After reading that, you could see that I was pretty damn excited to see a modern version of this Stephen King classic. Now that I’ve seen it, I seem to have mixed thoughts on the finished product. Let’s start with the positives, and first up is the acting which is excellent all around. Jason Clarke proves yet again why he is one of the best working actors today with his turn here as our protagonist Dr Louis Creed. Although his character doesn’t have much to work with (I’ll talk about that soon), Clarke manages to use everything he can to give an excellent performance. Amy Seimetz was also excellent as Rachel Creed, the mother of the family. She easily has the best backstory in the movie, and she’s one of the only characters you can feel something for as the film progresses. Seimetz does a great job at portraying this character who is suffering from a past traumatic experience, and it’s very entertaining (well, entertaining in a dark and twisted way) to watch. When a movie has John Lithgow in it, you can’t help but talk about him, and his performance as Jud is definitely one of his best yet! Lithgow gives it his all as this sweet neighbour with a sad history, and every time he is on-screen, you’re guaranteed a fantastic and scene-stealing performance. He had a lot to live up to with Fred Gwynne’s 1989 performance being the best part of the original, and he did an excellent job. Jeté Laurence was also terrific as Ellie Creed, who could’ve and should’ve been the protagonist for a substantial chunk of the movie. Her character was interesting and easy to connect with, and Laurence was terrific in the role. Yet another excellent example of how amazing modern day child actors are! The cinematography from Laurie Rose (his work on Peaky Blinders is his most known) is also pretty solid. Rose knows how to give you a sense of dread just from the framing of certain characters, animals and items and it adds a lot to the overall scariness of the movie. What I also really like about the cinematography is how it makes slight changes to the typical horror format. There are a lot of shots here that feel familiar, but Rose adds his own little twist on them, and it results in a more horrific and disturbing movie. I should also talk about the direction from Kevin Kölsch and Dennis Widmyer which is pretty good. As I mentioned earlier, the whole movie has a great sense of dread and discomfort throughout which adds to the overall scariness of it. Kölsch and Widmyer have done well to make you feel like something terrible is going to happen, and it results in a tense and very disturbing movie experience. Now, as I mentioned earlier, despite Pet Sematary having a lot of positives, I still feel like the movie could’ve been a lot better. This comes down to the writing and structure. This leads me to the structure, which could’ve been better as well. Since the first half is based around exposition, it can lead to you wanting something to happen. Yes, you could argue that something horrifying does occur in this first half, but if there weren’t as much expositional dialogue, it would be more effective at scaring us. Then when the second half comes around, which is literally just disturbing chaos, I loved it. This was the movie I wanted, and I just wish the exposition didn’t take up half of the film. I also feel like there needed to be another 10-20 minutes just to allow for more character development. Considering Louis is the character we’re meant to connect to the most, it feels like there should’ve been more backstory for him like there was with Rachel. It seems like there were more scenes based around his character, but they aren’t there, and therefore it feels a little unfinished in certain areas. I also feel like the third act should’ve gone for an extra five (hell, even 10) minutes. It feels a little rushed, and I would’ve loved for a more drawn out last third that really tapped into unsettling horror even more, as that was easily the best part of the movie. The most frustrating thing is that there is a brilliant horror movie in this, but it’s in the form of another cut that will probably never be released. There are so many great elements here, but it just gets bogged down by a few negatives, and it just makes me sad. Overall, Pet Sematary is a fresh, and unique remake/adaptation of the Stephen King classic. Although the first half is bogged down with unnecessary expositon and the overall film could’ve benefitted with a slightly longer run-time, Pet Sematary is still a fun and unsettling horror movie thanks to fantastic performances, atmoshperic cinematography and great direction. It may not be the remake many were hoping for, but this is still a fun horror experience. I had no idea there was a remake. I was really scared of the original movie when I was a kid. Thanks for the review. Thanks! The original also scared me as a kid (especially the flashback), so I was really keen for this remake.